Thanks go to Perry-Castaneda Library of The University of Texas of Austin for making these volumes available for photocopying. 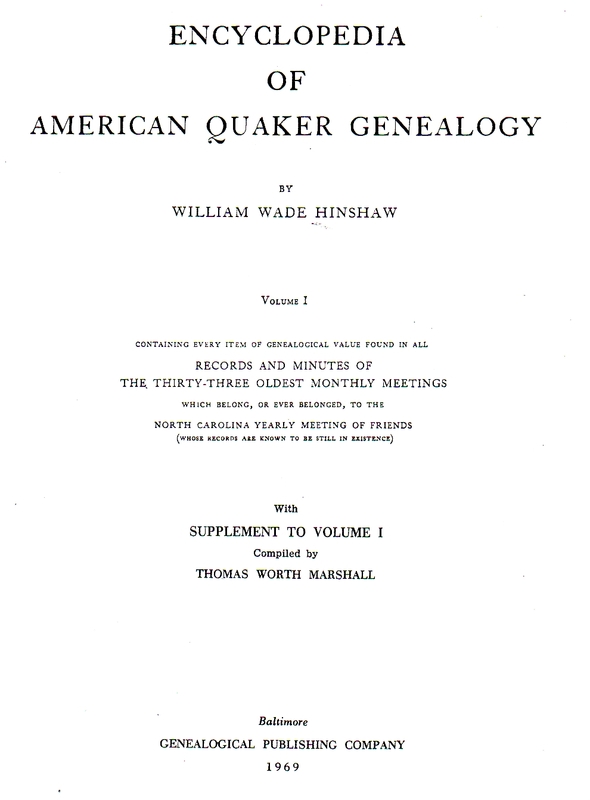 William Wade Hinshaw’s Encyclopedia of American Quaker Genealogy consists of six volumes, each dealing with a different region, and is supplemented by Willard Heiss’s Abstracts of the Records of the Society of Friends in Indiana in seven parts. Volume 1 of Hinshaw is the abstract of the early records of North and South Carolina, Georgia and Tennessee. Researchers should always consult this volume before using the meeting records on microfilm. The volume is available at many libraries, including Greensboro Public Library and High Point Public Library, in their genealogy or local history collection. A copy for use when the research room is closed is available at the first study carrel on the back wall in the Quaker open stacks (Room 117, adjacent to the Research Room). The book is also available for purchase from the Genealogical Publishing Company (1-800-296-6687 or www.genealogybookshop.com). The volume is arranged by meeting (church), beginning with the oldest and ending with the youngest. Each meeting is introduced with a brief history that includes the names of the earliest members. 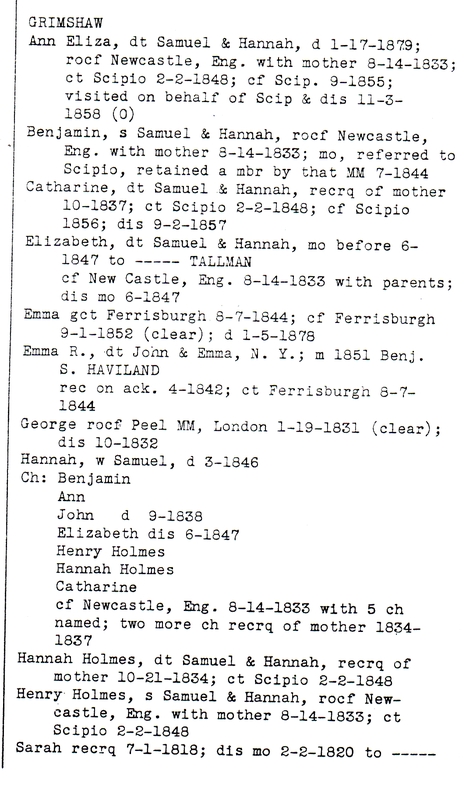 Next is a section listing information from the meeting’s birth and death records, arranged alphabetically by family name. Following that is an abstract of the minutes of the meeting, including marriages, new memberships, transfers of membership, disownments, and restorations to membership. Again the entries are arranged alphabetically by family, and the chronologically. Most researchers begin by looking up a family name in the index, which begins on page 1165. There is also a supplement in the back of the book, after the general index. It has it’s own index. After each family name is a series of page numbers. These are the pages on which members of this family are mentioned. Page numbers in parentheses () are entries in which the family member appears under another family’s name, as when a woman is mentioned in reference to her husband’s family name. THE TRICKIEST PART OF USING HINSHAW is understanding the abbreviations. They are listed on page xv near the front of the volume, but the distinctive Quaker terminology may still be confusing. For this reason, a fuller explanation is provided below. cert. Certificate: a statement issued by a monthly meeting to a person (or persons) transferring their membership to another monthly meeting. Also a marriage certificate. co. chosen overseer(s): selected for an important office of responsibility in the meeting. com. complained, complained of: a person could be complained of for an act that was contrary to the rules and advices as outlined in the Discipline. Unless the member could satisfy the monthly meeting of his or her innocence or repentance, the next step was usually disownment. con. condemned: an act of confession and repentance by a member who had been “complained of” (“reported”) or even “disowned” for a violation of the Discipline. When a person “condemned” his or her own misconduct, the monthly meeting might then restore him or her to membership. dis. disowned, disowned for: removed from membership for violation of the rules or advices in the Discipline; does not imply exclusion from worship, but only the right to participate in decision making. Unless the person later repented and “condemned” his or her own misconduct and was later readmitted into membership, he or she would not be mentioned again in the minutes. gc. granted certificate: permitted to move one’s membership. gct. granted certificate to: permitted to move one’s membership to a particular meeting. gl. granted letter: permitted to move one’s membership to a church of another denomination. jas. joined another (religious) society (denomination). ltm. liberated to marry, left at liberty to marry: permitted to marry. m. marry, married, marrying, marriage. mcd. married contrary to disciple: married another Friend, but in a civil ceremony (usually resulting in disownment); sometimes used interchangeably with “married out of society” or “married out of unity”. MH. meetinghouse: the church building. MM. monthly meeting: the lowest administrative unit of Friends, originally comprising of several particular or “preparative” meetings (congregations) that met together monthly to transact church business. mos. married out of society: married a non-Friend, usually resulting in disownment; sometimes used interchangeably with “married contrary to discipline” or “married out of unity”. mtg. meeting: may refer to a Friends religious service (“meeting for worship”), and administrative meeting (“meeting for business,” “monthly meeting,” etc. ), or the congregation itself. prc. produced a certificate: transferred membership. prcf. produced a certificate from: transferred membership from one meeting to another. QM. quarterly meeting: the second administrative level of Friends, comprising of several “monthly” meetings that met together quarterly to transact church business. rec. receive, received (into membership). recrq. received (into membership) by request, rather than by transfer of membership from another Friends Meeting. relfc. released from care for: no longer under consideration for a disciplinary offense; acquitted. relrq. released by request: withdrew from membership in the Society of Friends, unless reinstated, this person would not be mentioned again in the minutes. rem. remove, removed: move or moved to another location and/or meeting. rm. 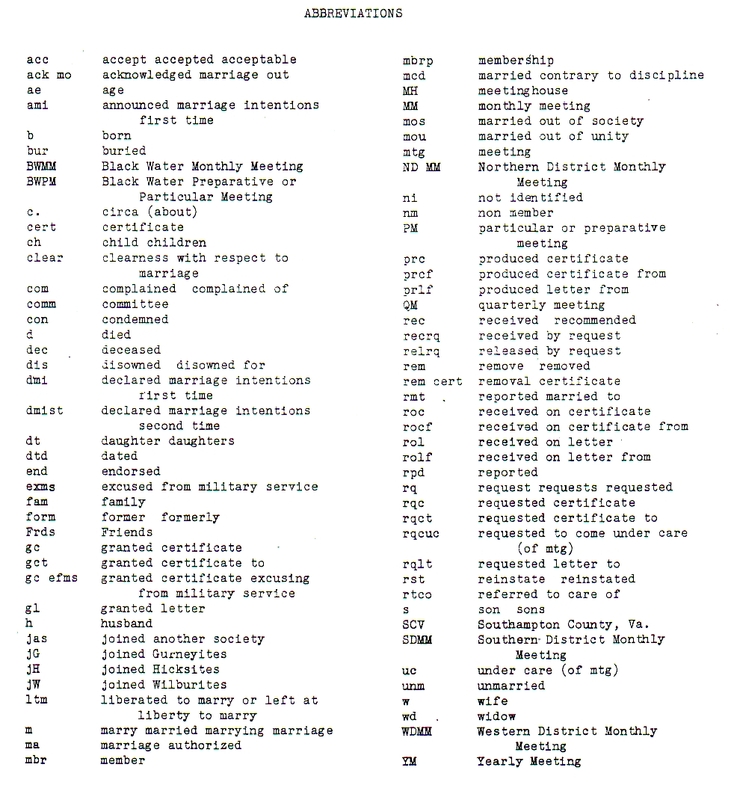 reported married: the marriage certificate was not included in the minutes, but the fact that the wedding took place and the name of the marriage partner were noted. roc. received on certificate: membership transferred from another Friends meeting. rol. received on letter: membership transferred from a church of another denomination. rolf. received on letter from: membership transferred from a particular church of another denomination. rpd. reported: complained, complained of for an act contrary to the rules and advices as outlined in the Discipline. Unless the member could satisfy the monthly meeting of his or her innocence or repentance, the next step was usually disownment. rqc. requested certificate: requested a transfer of membership. rqct. requested certificate to: requested a transfer of membership to a particular Friends meeting. rqcuc. requested to come under care (of a meeting): requested to be considered for membership. uc. under care (of a meeting) for membership. YM. Yearly Meeting: the highest administrative level of Friends, comprising of several quarterly meetings that met together annually to conduct business. Unlike some other religious denominations, Friends have not traditionally maintained centralized records of our membership. 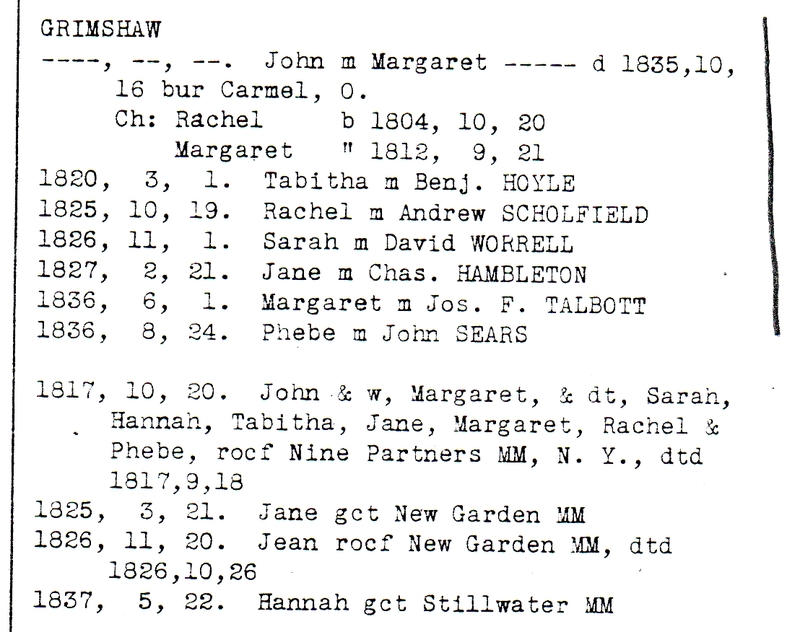 However, individual monthly meetings (congregations) generally kept good records of their members’ vital statistics (births, deaths, marriages, changes in membership). It is important that the ancestor you are researching formally joined the meeting. Such records were usually not maintained for non-members, even if they attended Friends worship. The vast majority of such records are not online and are not entered into computer databases, so a researcher will need to examine the records directly. If you know the name of the monthly meeting in question, and the dates you are interested in, you can usually find out where those archives are kept. If you only know the approximate location, and not the name of the meeting, your search may be more complicated, depending on whether there were multiple meetings that could have been involved. Monthly meetings usually belong to a larger group of meetings in the same general vicinity, called quarterly meetings, and those quarters, in turn, belong to even larger regional bodies called yearly meetings. Frequently, the records of these bodies are archived together. Most archives of Philadelphia Yearly Meeting and Baltimore Yearly Meeting are stored with one or both of the two libraries listed below. The records of New York Yearly Meeting are deposited in the Friends Historical Library at Swarthmore College. Generally, the librarians can advise you where to look, if the records you are seeking are not in one of these collections. A publication worth noting is: Encyclopedia of American Quaker Genealogy by William Wade Hinshaw, published by Genealogical Publishing Company, Baltimore, MD 21202. Currently, only Vol. II (Pennsylvania and New Jersey) is still in print; however other volumes should be available through libraries or secondhand.